Building upon the foundation (pun intended) from our last article on foot/ankle health, we continue moving up the kinetic chain to examine the knee. Although the knee is a source of much chronic pain and injury we must recognize that for the most part it is at the mercy of the highly mobile foot/ankle below and hip above. For simplicity we will keep with our examination of knee issues independently, however it’s important to keep in mind knee pain usually has origins below and above. Although we view the knee has a hinge joint that flexes and extends the knee we must understand that when bent it possess a large capacity to rotate. The hamstring muscle group on the back of thigh are the tissues that cause the majority of this rotational movement. In addition to the rotation of the tibia under the femur, another potential imbalance originates from the quads disrupting how the patella tracks during motion. To ensure this article stays a reasonable length we will not be discussing the different self-care options. Feel free to explore the internet or contact Hybrid Health for further information. Most knee issues can, and should be, self-managed. This takes a little education and self-discipline (easier said than done). The Quadriceps group consists of four muscles: Vastus Lateralis, Vastus Medialis, Vastus Intermedius, and Rectus Femoris. The primary action of these muscles is extension of the knee although the Rectus Femoris does play a large role in hip flexion as well. This group is one of the most powerful in our body, capable of generating tremendous force and at the same time capable of causing a wide variety of dysfunction. The most common imbalance encountered is over-development of the Vastus Lateralis coupled with a weak inhibited Vastus Medialis. This will cause an uneven pull on the patella encouraging it to track laterally. This places continuous stress on the patellar tendon leading to tendinosis and damage to the cartilage below. Stretching and compression to the Vastus Lateralis along with Vastus Medialis strengthening will help to alleviate these issues. Over restriction of the Rectus Femoris is another dysfunction in this group. Prolonged sitting and side sleeping places this muscle in a semi-shortened position for much of the day. 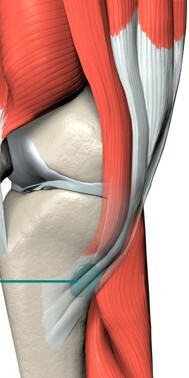 As the tissue begins to shorten and adapt it will pull across the top of the patella when the body is upright. This increases joint compression irritating the patellar tendon and cartilage below. On the back of the thigh we have the hamstring muscle group. This consists the Biceps Femoris on the outside of the thigh and the Semi-Membranosis and Semi-Tendinosis on the inner side. Most people suffer from tight hamstrings as a result of overly shortened quads and hip flexors. In this situation stretching the hamstrings aggressively should be avoided as it will further exacerbate the muscular spasm. Focus should be placed on quad/hip flexor health. The more nuanced condition arising from the hamstrings comes from an imbalance around the attachments at the knee. Shortening of the lower Biceps Femoris, compared to the other hamstring muscles, causes the fibula and tibia of the lower leg to rotate laterally placing a rotational shearing stress on all structures of the knee. Left unchecked this increases the likelihood of meniscus damage, ligament sprains, and patellar tendinosis. The right Biceps Femoris tends to be worse based on how we hold our leg while driving our vehicles. Isolating your stretch to either the medial or lateral hamstrings, depending on which is pulling the lower leg out of alignment, will balance the rotation and remove the shearing stress placed on the joint structures. The Pes Anserine consists of the tendon attachments of the Sartorius, Gracilis, and Semi-Tendinosis at the inside of the knee. These muscles attach along the upper part of the inner knee in very close proximity to one another. Stress being handled by these tissue is transmitted through the tendons into this common attachment. For many it is chronically inflamed and painful. Gentle friction to the region will help decrease symptoms however each of these muscles must be evaluated for dysfunction to identify where the source of irritation is originating from. Keep in mind it could ha ve origins below or above as stated earlier. Pain felt in the knee as contributed from the IT band is located on the lateral side. Most likely this is a hip issue and will be discussed in the next article. The common approach of foam rolling up and down the IT band to release the tissue yields minimal to zero long term results and comes with a huge amount of discomfort. For now, recognize the IT band is pulled tight by its muscular components the Tensor Fascia Latae and Gluteus Maximus on the hip. As stated at the beginning of this article, to find the root cause of knee dysfunction we have to always consider and care for the foot, ankle and hip. Dysfunction in these structures causes the knee to compensate and take on an additional amount of responsibility that cannot be sustained. For any questions or if you wish to dive deeper into these anatomical relationships please feel free to contact Hybrid Health at any time.